There are a lot—and I mean a lot—of snacks and desserts to be found among Disney World's four theme parks, two water parks, Downtown Disney, many hotels, and elsewhere throughout the resort. Whether you top off a meal at a sit-down restaurant with a special treat or grab something from a cart or quick-service window, the choices are enough to make your head spin faster than a whirl aboard the Mad Tea Party spinning teacups ride. With only so many days and limited stomach capacity for your Florida vacation, you'll want to be judicious in your snack choices. But how could you determine which items deserve your caloric intake among the bazillion of options? That's where I can help. The following ten items were chosen by travel gurus who frequently visit the parks and know where to find the most delicious goodies. Through trial and error, word of mouth, and just plain, well, act of mouth, they've narrowed down the field to the best of the best. To learn about the wonderful panel of judges who participated in the snacks survey, go to the Best Disney World Dining feature. Looking for something more substantial to eat? Check out our rankings of Disney World's best table service restaurants and Disney World's best casual and quick-service restaurants. Disney Springs is so humongous, we have a separate list of the places to dine there. We've also compiled the info you need to know about Disney World character dining and Disney World free dining. Have you ever wondered what the heck Lumiere means by "the grey stuff?" 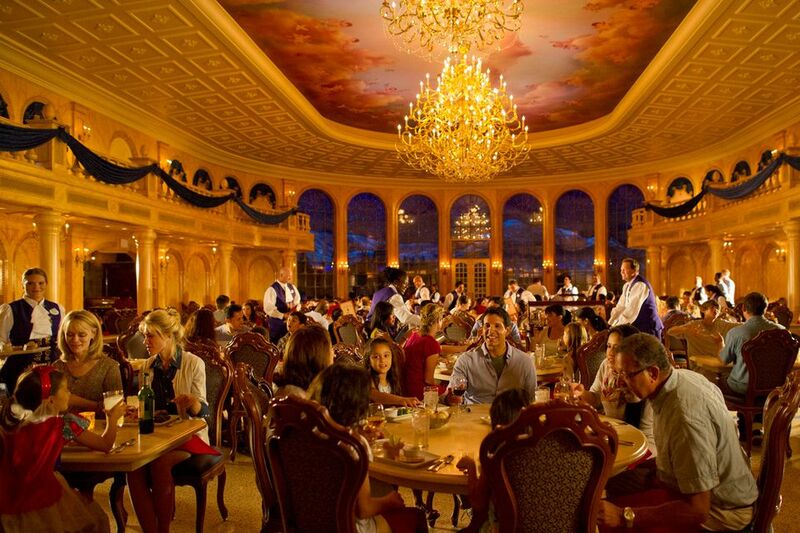 Well, you can try it yourself at the opulent Be Our Guest restaurant tucked inside Beast's castle. The whipped confection, which has hints of cookies and cream and is adorned with bits of crisp rice (and is actually more brown than grey), is offered as a standalone dessert item or as a topping for a yummy cupcake. Judge Robert Niles of ThemeParkInsider.com says that it's not so much the taste but the novelty and hard-to-get factor that makes The Grey Stuff one of Disney World's best finds. While the sweets are wonderful—and the focus of this countdown—Les Halles Boulangerie also offers baguette sandwiches (the bread is fabulous), salads, and other light items, as well as wine, beer, and champagne, so you could stop here for a complete three-course meal. Judge Robb Alvey of Theme Park Review says the Patisserie is a hidden restaurant gem at Epcot and offers great value. Search for discount Disney's Beach Club Resort rates at Trip Advisor. Remember when nobody cared about cholesterol and all of that other dietary buzzkill? The retro soda shop inside Disney's Beach Club will help figuratively turn back the clock so that you can block out the copious saturated fat and other pesky modern-day evils lurking in the extravaganza known as the Kitchen Sink. It includes—get this—eight scoops of vanilla, strawberry, chocolate, mint chocolate chip, and coffee ice cream mashed up with brownies, hot fudge sauce, bananas, angel food cake, and virtually every other topping in the joint. I prefer my desserts a bit more on the subtle side, but if you want to fuel your day at the theme parks with an extreme sugar high, this will surely get your motor running. My advice: Invite a bunch of buddies to a Kitchen Sink pig-out, and ask your server for a bunch of spoons. Come on. It just wouldn't be a trip to Disney World without at least one Mickey Bar, right? The smooth vanilla ice cream covered in glorious dark chocolate always hits the spot, especially on a sweltering Florida day in one of the parks. It may not actually be among the most decadent and best-tasting dessert items in the resort (although it is pretty damn tasty), but it is so intrinsically part of the Disney experience that virtually all of the judges included it on their top-ten list. I defy you to consume an entire bar without dropping a coveted piece of chocolate coating onto the ground. And I defy you to deny that you never looked at one of your just-dropped pieces of scrumptious chocolate and thought, "Hmm, they do keep this place pretty clean. Maybe I could…." I told you our top-ten list would return to Disney's wonderful French bakery, non? If you and your gang have any room left after polishing off a Napoleon, consider getting macarons aux framboises (raspberry macaroons). The delicate pink-hued morsels feature raspberry jam, ganache, and fresh raspberries sandwiched between two almond-heavy cookies. How do you say "yum" in French? Search for discount Disney's Polynesian Village Resort rates at Trip Advisor. But, according to our judges, they would be wise to hold off a bit on the main course and save room for dessert. The ‘Ohana Bread Pudding à la mode with Bananas Caramel Sauce, which is included in the gorge-a-thon, is worth pacing yourself during the meal. You'll be rewarded with a pineapple- and white chocolate-infused bread pudding topped with a scoop of vanilla ice cream and a Bananas Foster sauce that'll have you smacking your lips and praising the tiki Gods. Then you can run to the gift shop for the antacid tablet. Aren't you glad you clicked on this list? Because of your savvy and impeccably good taste in Web sites, you've got the insider's guide to good-tasting goodies at Disney World. This may be the most inside of the top-ten picks on the list. The Writer's Stop is tucked away in Disney's Hollywood Studios on the Streets of America near the Sci-Fi Dine-In Theater Restaurant. Blink and you'll miss it. But because you are so savvy, you will walk in, ogle the modest selection of snacks and drinks, and order a carrot cake cookie (and possibly some milk to wash it down). And you will be thanking me (and our judges) later for making the recommendation. Here is how judge Ashley Nichols of Theme Park Foodie describes the cookie: "It is a whoopee pie that features sweet cream cheese frosting, sandwiched between two soft, moist carrot cake cookies and is big enough for two (or three!)." She adds that it is a great snack to bring along to Fantasmic. What, you may wonder, is a waffle sandwich? Disney starts with a freshly made, huge, yummy waffle (sadly, not a Mickey Mouse-shaped waffle, which can be found elsewhere in the resort), folds it in half sort of like a taco, and then stuffs it (and I mean STUFFS IT) to make one of three sandwiches: ham, prosciutto, and Swiss cheese; Nutella and fresh fruit; and sweet and spicy chicken. I'd heard of waffles and chicken before (although not necessarily a sandwich), but never the other two creative takes on waffles. Since they are so huge, I am not sure they qualify as a "snack." These sandwiches would satisfy most visitors as a meal. They include interesting touches such as a slightly spicy Asian sauce and coleslaw for the chicken waffle. If the Mickey Ice Cream Bar was on the list, you knew that Dole Whip had to be here as well. Again, an argument could be made that there are "better" desserts to be found at the resort, but Dole Whip is another Disney World ritual for many visitors. The weird thing is that it is not distinctly Disney; although it's not common, you can find pineapple-flavored soft serve outside of the Disney parks. But, my guess is that most people would probably opt for some other flavor given the choice at your local ice cream stand. Walking through Adventureland, however, a Dole Whip is a must-have for me and countless others. Here is a tip: If the lines are long at the park, or you don't have plans to go to the Magic Kingdom, you can still get your Disney World Dole Whip fix by heading over to the Polynesian Resort. It's self-serve at Capt. Cook's, and while I'm not sure about the official policy, I've seen plenty of customers fill up their cups for seconds—and thirds even. In addition to pineapple, you could order orange or vanilla Dole Whip, or swirl them together. You could also splurge for a pineapple float which perches a dollop of Dole Whip atop pineapple juice. OK, dessert divas, that wraps up our top-10 list. Here's to happy snacking for your next and future visits to the parks.